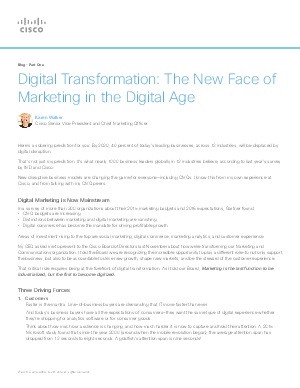 Note: Part 1 of Karen Walker’s blog series shares her insights about Digital Transformation and the 3 driving forces behind the transformation happening in the Marketing function. Excerpt: Here’s a sobering prediction for you: By 2020, 40 percent of today’s leading businesses, across 12 industries, will be displaced by digital disruption. That’s not just my prediction. It’s what nearly 1000 business leaders globally in 12 industries believe, according to last year’s survey by IMD and Cisco. New disruptive business models are changing the game for everyone—including CMOs. I know this from my own experience at Cisco, and from talking with my CMO peers.